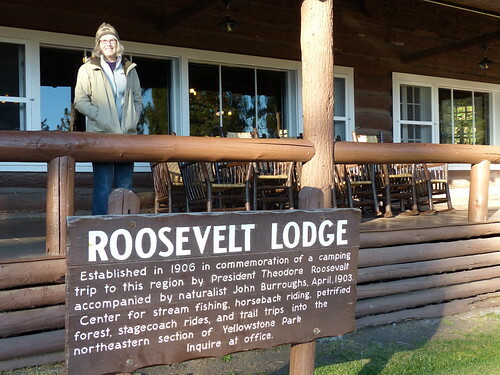 It was in May of 2013, on our first visit to Yellowstone, that we heard about the Roosevelt Rendezvous. One of the naturalists at the Yellowstone Association told us about it. After the Roosevelt Lodge in Yellowstone closes for the season, there’s a special four-night gathering, the Rendezvous, where visitors stay in the Roughrider Cabins, choose from a variety of outings each day led by biology, geology, or history specialists, and gather at the Lodge in the evening for cocktails, dinner, and presentations on topics of interest. She called it “summer camp for grown-ups”. Could it actually be as great as it sounds? Well, pull up a chair, because I’m fixing to tell you all about it. First, you need to get to Wyoming. We made our way by air from SFO to Bozeman, MT. I like Bozeman. It’s one of those attractive, outdoors-oriented, friendly New West towns that prompt you to say, “sure, I could live here”. 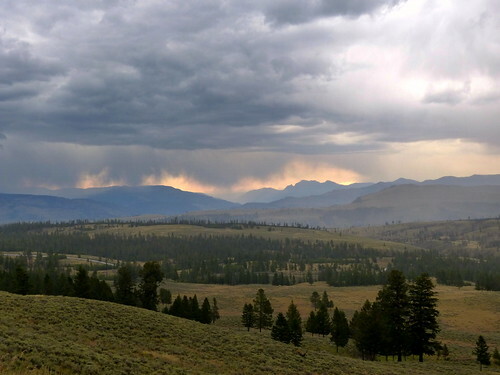 We made our way on down to Yellowstone from there, enjoying the delightful weather and lovely scenery. After a lunch stop at Mammoth, we headed for our car and I said, “hey, look at that”. There was an enormous dark cloud looming overhead. Where did that thing come from? The sky darkened further on a short walk around the Forces of the Northern Range trail on the road to Roosevelt Lodge. As we walked around and read the helpful interpretive signs, thunder started rolling. I assured the Resident Expert that the storm was moving away from us. So why then did the thunder and lightning increase in frequency and volume? Because I don’t know what I’m talking about, that’s why. We continued on, but kept our tourism confined mostly to our vehicle, after getting hailed on at the Calcite Spring overlook. Here you can see one of these super-cells prowling across the landscape. We arrived at the Lodge and checked in around 4pm, which gave us a little time to check out our cabin and stow our gear before the 5pm cocktail bell (there isn’t really a bell) rang. And here is where it starts to get interesting. The Rendezvous draws from across a fairly broad age spectrum, and from all over the States, with the unifying characteristic of being the kinds of people who want to go to the Roosevelt Rendezvous. If you don’t mind a little weather, outdoorsy activities, and spartan accommodations mixed in with your cocktail hour, then you’re our kind of people. It doesn’t take long for the individual personalities to emerge, and by the end of the four days the various characters in the narrative were fully developed. The first night’s after dinner presentation was excellent: a talk about animal communication by George Bumann, a local sculptor and wildlife biologist. He has a very special talent for bird mimicry. I didn’t expect the evening entertainment to be this good, so we trundled off to our cabin fully satisfied, with high hopes. 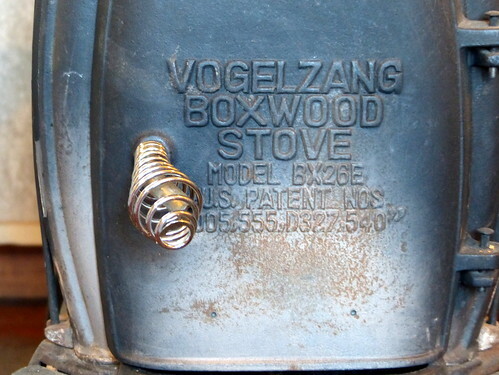 I got a little fire going in our stove, The Voglezang. Fortunately we brought our sleeping bags and a new camping rig addition – silk travel sheets – that are used to line the sleeping bag. We would need them. It gets cold here, even in early September, and The Vogelzang’s wood supply burns fast. You’d have to add wood every couple of hours to keep the fire going all night. But we were plenty cozy in our sleeping bags. Coffee is ready at 6am in the Lodge, and we were there at 6:01. Breakfast is at 7, and then by 8 you’re off on the day’s first adventure. Each day you have 6 options to choose from; 4 half-day outings (2 each morning and afternoon) and 2 full-day outings. The 6 options change each day. 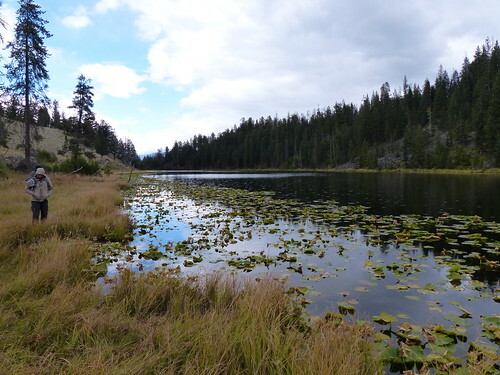 We chose the Hoodoos and Pika trip for the morning, then a hike to Lost Lake in the afternoon. 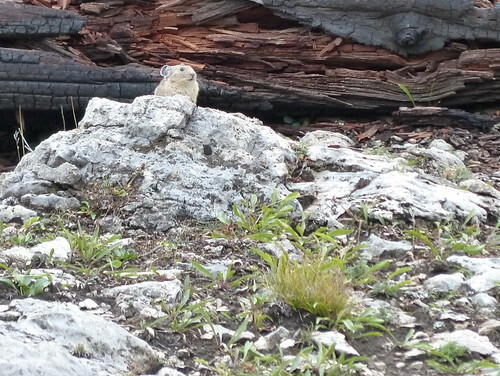 The Pika trip takes the group back to around Mammoth Hot Springs by van, where you hike up to the Hoodoos, an area of interesting rock formations. Large blocks of travertine have broken off the face of Terrace Mountain and tumbled down to create what they’ve called “The Hoodoos”. There’s actually a geologic feature called a hoodoo that’s nothing like this. You see them in the Southwest, in places like Bryce Canyon and Goblin Valley. Just couldn’t resist calling these rocks “hoodoos”, I guess. They are cool looking though. 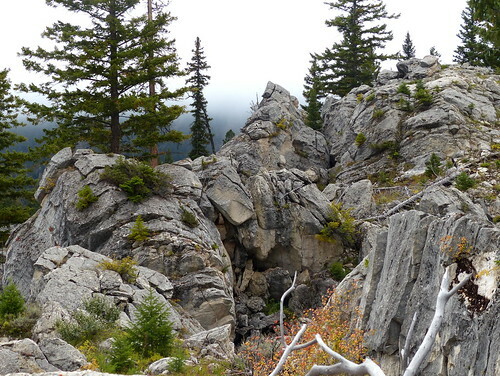 Doesn’t this look like the kind of place where a Pika would hang out? What’s a “Pika”, you ask? It’s a small, cute animal, that resembles a rodent, but is actually in the rabbit family. Here’s one, looking out of his Pika dwelling. It took a while to actually see any Pika. We could hear them: their “eep, eep” sound was tantalizingly close. Finally, just as we were about to leave, one of the group saw one and snagged a picture. After a bit more time, we all started seeing them. Just have to be patient. This walk also featured a surprising number of birds. A flock of robins escorted us up the trail, and we also encountered Juncos, Flicker, Cedar Waxwing, and a Ruffed Grouse. I wasn’t sure what to expect in the bird department on this trip, and so it was nice to see a few on this cloudy, chilly morning. 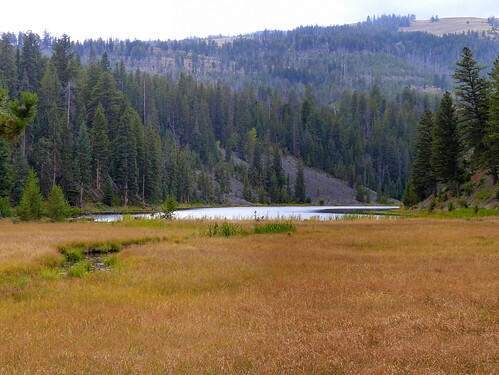 We headed back to the Lodge for lunch, and then set out on a hike to Lost Lake. The sky was threatening rain, but we only had a passing shower or two. Our goal was to find the Tiger Salamander at Lost Lake, but it was not to be. I’m sure they would have been cool to see, but the walk was fully satisfactory on its own. Here’s the Resident Expert and the lily pads of Lost Lake. 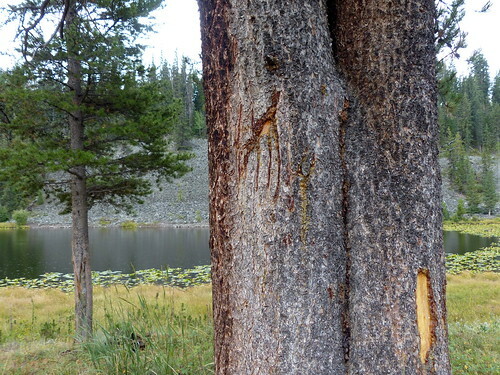 And some bear claw marks on a tree by the lake. And one last look at Lost Lake as we make our way down the trail. We had plenty of time to relax and enjoy the cocktail hour, comparing trail notes with people who had been on other adventures. Tonight’s presentation was from Kira Cassidy-Quimby of the Yellowstone Wolf Project. She talked about the current status of the wolves, the challenges they face 20 years after re-introduction to Yellowstone, and related issues. The previous night’s talk was Popular Science, and tonight’s was Science. Like the other program options at the Rendezvous, the evening presentations cover a range of intensity as well. After the talk, we hustled back to Cabin 75 to get the fire going. It’s getting chilly again! That’s enough for now. The upcoming installment will describe our next Roosevelt Rendezvous adventure, the “Hellroaring to Home” hike. I’ll bet you can’t wait to hear about it!